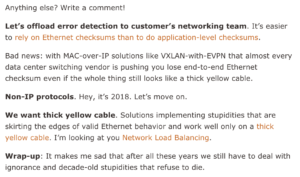 A recent post from Ivan Pepelnjak entitled Revisited: The Need For Stretched VLANs made me smile rather bitterly as Ivan dug into the apparent continued desire for stretched layer 2 networks and the reasons people give for the solution’s requirement and validity. I love a good bit of snark as much as the next nerd, so as you can imagine, I’m all over that post. 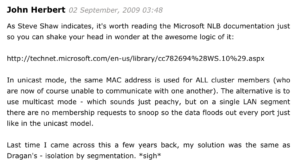 My mind was thrown back to the heady days of 2009 when I stumbled across another post from Mr Pepelnjak, this time entitled Turn a switch into a hub … the Microsoft Way which bemoaned the unadulterated stupidity of Microsoft’s attempt to use layer 2 network flooding to accomplish clustering. 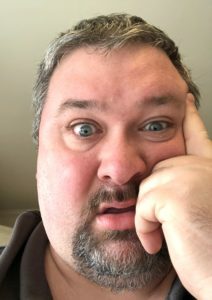 I had discovered the nature of this behavior at a previous client and had my mind blown by the very stupid and non-standards-compliant way in which this had been implemented. Once more, we prove the maxim that everything old is new again. Thanks for the (slightly agonizing) trip down memory lane, Ivan!